Anyone else like Windows 3.1? You can always try DOSBOX and sloooooooow things down... a whole bunch! Yeah I need to try DOSbox. But I'm having too much fun with console stuffs to bother. to basically "waste" idle CPU cycles by executing pointless loops. You could adjust the program to make the game run as fast or slow as you wanted. But some games were designed to run on 8-12Mhz CPU. Still a simple wait for Vblank command would allow the program to run as intended even on a multigigahertz CPU, right? By the early 90s... nearly all games had built in speed adjustment, or... the additional speed only helped the game. But back in the day, running some games on an 8.77mhz 8088 proved to be WAAAY to fast... which was why many of the 8088s had turbo switches so you could de-clock them back to 4.77, pretty hilarious. Yeah I remember turbo switches, but was never sure what they were for exactly. I have seen them too. Vague memories of DOS PCs in middle school with turbo buttons. Teacher told us not to press them. I thought it was silly to have to use a button to boost speed. Later on I had dreams of a "hurry the f*** up" button that would just ignore physics constraints and instantly finish whatever job it was working on, no matter how large the task. PCs kind of went full circle now with machines that automatically overclock themselves within thermal design specs. My 8 core FX-8150 got a big heat sink and permanent overclock at 4.2Ghz, the maximum turbo rate, with no overvolt, and it runs stable as the Great Pyramid. I once bumped it to 4.5 Ghz and had crashes. I later installed a 16 Gbyte set (8Gb x 2) of Raedon 1866Mhz DDR3. My rig pulls 90 watts idle at the outlet, 255w 100% load using fractal renderers, up to 300 watts running the Intel Burn test on all 8 cores. Not bad for a CPU with 125w TDP (thermal design power). With big heatsink you can safely exceed TDP if you watch your temps. Of course with many of those ancient CPUs did not have a sink at all or just had a passive brick on them.
. I once bumped it to 45.5 Ghz and had crashes. Edited by Osgeld, Thu Dec 31, 2015 9:43 AM. They probably should have called it something else, since the "Turbo" state was the normal state. I bet people thought they were hurting their computers by running them too fast so they turned that off. Sigh. Clones were such bad design but they crushed Amiga/AtariST/Mac and all the other competitors so we were stuck with them. Clones, despite the derogatory moniker, were highly adaptable and got the job done. With the possible exception of the Apple II and Mac lineup, I couldn't see any of the 8 or 16 bit machines of yore evolving into an acceptable ecosphere for today. Simple tasks like word processing and file interchangeability/standardization were cornerstones to clones. The rest was riff-raff, a circus parade of comical design that promoted frustration to no end..
Edited by Keatah, Thu Dec 31, 2015 10:43 AM. For retro builds today, "turbo" functionality via a case button (or key combo) is very nice to have, and clean builds with a functioning LED display are collectible and command a premium. Popular DOS titles such as Wing Commander are really picky about clockspeed, and software-based solutions are not always compatible. I bought a working AMD K6 machine just for its case. It has a full three-digit LED (most have two full digits and a "1" for the hundreds digit). I installed a Super Socket 7 motherboard and an AMD K6-3+, overclocked to 550MHz. This is a mobile processor whose clockspeed can be adjusted via software. Because there is no "Turbo" header on SS7 boards, I used the "Turbo" button to switch between 66MHz and 100MHz FSB on the motherboard. So, without opening the case, I can run this machine from 133MHz (66Mhz x 2.0) to 550MHz (100MHz x 5.5) and anywhere in between. I can even turn off the internal cache and get the machine to run like a 486. I wish. I meant 4.5Ghz, typo. My biggest complaint with 3.1 is finding games. Windows 3.11 (the last of that series) Ran slow on era hardware and ate up Lower ram making it hard to run many of the legacy Dos games or programs of the time. What about Windows for Workgroups 3.11? I admit, I never really got to experience 3.x back in the day. 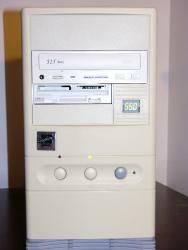 We had Apple II and Macs at school, my uncle had a Mac, then we got IBM PC Jrs, then straight to Win95B. Edited by Asaki, Fri Jan 1, 2016 10:56 AM. I have seen them too. Vague memories of DOS PCs in middle school with turbo buttons. Man, you guys are really making me feel old. I'm 37, that can't be THAT old? They were really necessary on the 8088s at the time, because everything was developed on simple clock cycles that understood that 4.77MHz was going to run at that specific speed. Some processors were faster, or processed the data faster, even if the clock speed was only 4.77MHz... like the NEC V20 (8088 clone) chip instead of the Intel 8088. I realize now going on YouTube, that almost no one has any video of some of these really old DOS games... I'm talking about the ones that used to play in CGA or in Hercules monochrome. Here is one of the more "advanced" ones... it was called "Red Baron," or more specifically... REDBARON.EXE. To play this came in 8.77MHz would be extremely difficult, you pretty much HAD to set it at 4.77MHz, otherwise you had difficulty playing. I remember trying to play this game on a 12MHz 286 Packard Bell, and the SECOND you turned on the engines, the plane would flash across the screen, get to the complete opposite side of the cavern and crash into the wall... all within a second. I've not been a huge fan of making YouTube videos except for some random car videos, but maybe I'll try to record a bunch of these and put them up. Win16Fan, you now have TWO people recommending Castle of the Winds... totally worth it. Get it from the links I posted above. The Ancient DOS Games channel on Youtube covers at least one of the CGA games: Flightmare. There may be more in the ADG series (which is great, btw). I remember loving Flightmare because of how advanced it was compared to other CGA games. Hahah, that game is pretty cool! I've never played that! I like the comment about doing it for the Gipper. Haha.. This game is definitely more advanced than some of the others I'm talking about. PTROOPER.EXE and BABY3.EXE are a couple of others that I remember. One that I've really been looking for is a game called "GRIME.EXE." Very cool game... I spent hours playing it. I tried saving as many games as I could from my old floppies, but I wasn't able to save them all. Is there some reason why they couldn't just lock the gamelay to the monitor refresh rate? I understand you could write as much stuff as you wanted to the screen between refreshes and if the CPU ran fast enough, stuff might not even get displayed between frames. Even locking to frame rate wouldn't have been foolproof as some video card / monitor combos could set to 70Hz, 75, or even 85Hz. I used to run my 1999 PC on my View Sonic at 1152x864x75Hz to reduce eye strain, but that's another story. Lots of old shareware DOS games from the early 90s played too fast or were completely broken on my Win98SE 400Mhz Celeron, but I had fun playing the other half of DOS games that actually worked. Some dude made a very impressive DOS MARIO.EXE I downloaded off the internet that I enjoyed a lot. Sadly when iupgraded to XP, the graphics no longer displayed correctly rendering it unplayable. DOSbox would be worth it to install just for that one Mario clone. Haha... I don't mean to laugh, but man, we're talking WAAAY prior to that kind of "era." The games from those days (REDBARON / PTROOPER, etc...) those games were from a time when I don't even think developers or people "thought" of refresh rates. The operating system... (DOS) didn't really have "drivers" for graphics cards. There were default settings that games were expected to follow. That was either 720x400 for hi-res Hercules monochrome games (like below, available in green or amber), or CGA and EGA. CGA / EGA was typically 320x200 resolution and was either in 4 colors (Magenta / Cyan / White / Black) or EGA 16-colors. You then also had early VGA which was 256 colors. I don't think refresh rates were even a "thought" or consideration for those games until you started getting into the early to mid 90s. Then there was Round 42, a fun shooter that used a special CGA mode to get more colors at a lower resolution. That's wild! I'd NEVER heard of that resolution / graphics configuration. Edited by Osgeld, Fri Jan 1, 2016 10:56 PM. PC/GEOS Source Code & Apps now on Git!